You have added One Shoulder Embellished Maxi Dress in Blush into shopping cart. FINAL SALE. Feminine and dramatic describes this chiffon maxi dress in a striking blush pink color. The One Shoulder Embellished Maxi Dress is fully lined except at the shoulder. It is crafted of a beautiful fluid chiffon fabric. The bust is lined and lightly padded for support. The flattering empire waistband has shirred fabric on one side and bold rhinestones on the other side. The one shoulder detail is decorated with rhinestones and an invisible side zipper completes this dress. The One Shoulder Embellished Maxi Dress is perfect for any evening event where you want to look classy but still fun. It would be perfect paired with strappy heels and a clutch. This is a great dress to pack on vacation or on a cruise. Details: Lined except at shoulder. Invisible side zipper. Adjustable strap. 100% polyester. Hand wash cold. Do not bleach. Low iron. Small measurements: Length from top of bust to hemline: 50”. Bust: 32-34”. You have added One Shoulder Embellished Maxi Dress in Blush into Wishlist. 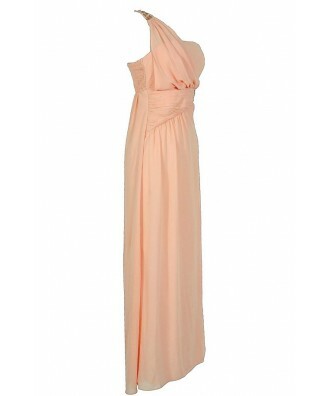 You have added One Shoulder Embellished Maxi Dress in Blush for Stock Notification. 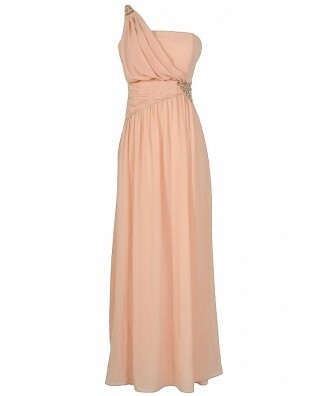 You have set One Shoulder Embellished Maxi Dress in Blush as a loved product. 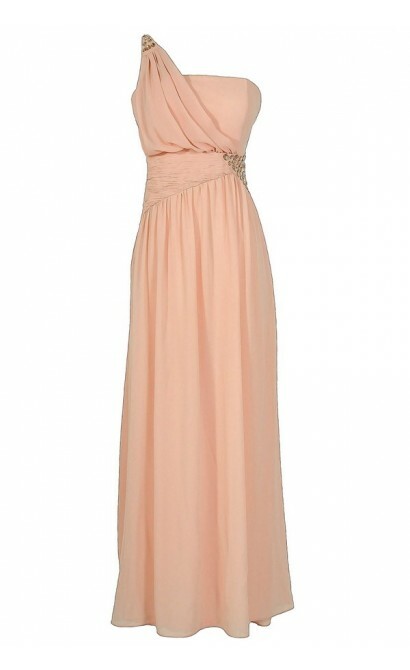 You have removed One Shoulder Embellished Maxi Dress in Blush as a loved product.